The success of cross-border transactions may be undermined by a number of factors and unforeseen circumstances. In order to secure their investment, the parties to an international trade contract often seek guarantees that serve as a contingency mechanism to sidestep unpleasant surprises. An international guarantee is an insurance coverage that protects an importer or an exporter, ensuring a compensation in case of breach of contract. Different types of coverage can be sought, depending on the contractual nature of the deal. Generally, the ICC Uniform Rules for Demand Guarantees, Publication No. 758E (URDG 758), 2010 edition, is the set of rules governing and regulating international demand guarantees. For the guarantee to be drawn on, the contractual terms for raising claims must be met, we at MPG give you legal advice to ensure that the terms and the verbiage of the guarantees are in line with your expectations and deliver the intended result. First demand guarantees, for instance, must be unconditionally honored by the guarantor upon beneficiary’s first demand, and the beneficiary is saved the trouble of making a claim or taking legal action against the obligor. Bid Bond. An assurance issued by a guarantor (a bank) to warrant that the importer (tenderee or project owner) receives an agreed compensation if the exporter (tenderer or contractor) defaults on its obligations under an international tender. The presentation of a bid bond is virtually always an indispensable condition for a tender to even be considered. Performance Bond. A guarantee that indemnifies the importer, should the exporter fail to meet its contractual obligations (failure of performance) and complete a project in a timely and satisfactory manner. The guarantee can offer coverage against a number of issues, such as quality, function or delivery. A performance bond usually covers 10-20% of the contract value. Advance Payment Bond. A type of guarantee that is commonly linked to a supply agreement for capital goods, wherein the importer has agreed to make a down payment, or in a service agreement, wherein a Contractor requires an advance payment to fund the preliminary costs and mobilization works of the contract. The advance payment is commonly between 10-30% of the contract value. This bond is issued to ensure that the contractor will pay back the advanced amount, should it fail to meet its contractual obligations. The terms of the repayment are agreed between the parties as either a deduction or recoupment from subsequent payments. Retention Bond. A Retention is a fraction of the amount due to a contractor (or exporter) on an interim certificate (or export contract) that is retained by the principal (or importer). The purpose of the retention is to ensure that the contractor/exporter honor their contractual obligations. A percentage of the amount retained is released upon completion of the contract and the remaining amount is paid upon issuance of a certificate of making good defects. A Retention Bond, which is a type of Performance Bond that can be used in lieu of retention, is a surety, whereby the principal agrees to pay the contractor the full amount due but is covered by a bond whose value matches the amount that would otherwise have been retained. Payment Guarantee. 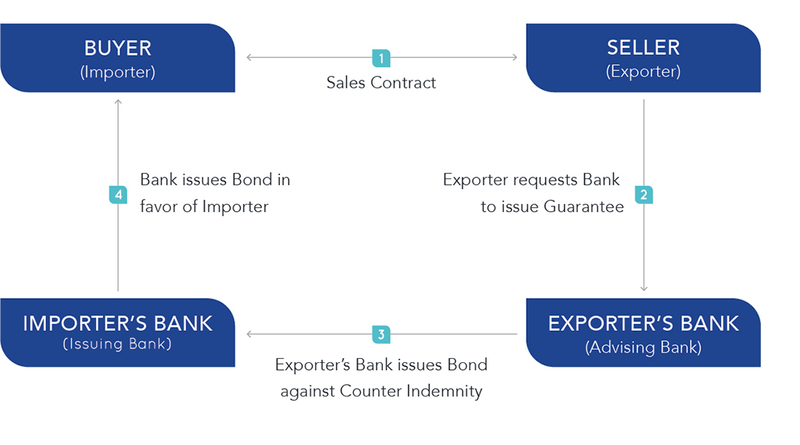 This surety is issued by a guarantor (commonly a bank or other financial institution) in favor of an exporter, should the importer default on their financial obligations under the export contract. A payment guarantee can be issued as an endorsement on a bill of exchange, also known as a Per Aval (third party) endorsement. By means of a Per Aval endorsement, the exporter benefits from the credit substitution of the guarantor for the importer.